A less well-known filme noir, Backfire is a dizzying collage of flashbacks within flashbacks, unreliable narrators, and double-lives where no one should be trusted to tell the truth. Bob Correy (Gordon MacRae) and Steven Connelly(Edmund O'Brien) are vets just back from the war with plans to live the American Dream by buying a ranch together- just as soon as Correy is released from the hospital where he's recovering from multiple, severe back injuries. The long months of recovery should be sweetened by the love developing between Correy and his nurse (Virginia Mayo), but his friend stops visiting, and, while in a drugged state, Correy gets a midnight caller in his hospital room with the desperate message that Connelly needs his help. No one believes any such visitor existed, but Connelly might very well need any help he can get because he's the number one suspect in a murder! The real story cranks up as Correy hears from those close to Connelly in the last days leading up to the murder. Is his friend capable of cold-blooded killing? Or has he in turn been murdered too? As Correy gets in deeper perhaps the better question is can our leading man escape that fate too? Warners Brothers has purchased the rights to a story called "Into the Night" in 1946, but most considered the story too unworkable for film with confusing shifts in narrators and multiple flashbacks that made the chronology of the story confusing. By 1948 though, the studio had succeeded in roping a director and script writers for the production. Jack Warner gave them six actors who he felt were "sitting around doing nothing, but picking up their checks" (Jack Warner not being known for his tact). They were all B-list movie stars for a B-movie. Ironically, though the film was finished that year it was not released until 1950, and in the meantime one of the actresses- Virginia Mayo- had achieved fame through another noir called White Heat. So the tagline for Backfire became "The White Heat Girl turns it on again!" despite Mayo's much more demure role in this film. The movie was met with luke-warm reviews; one critic commented that the best that could be said about the actors was "they got the thing done." Personally though, I liked it. 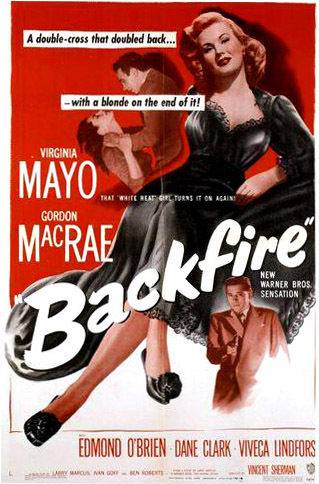 Film Noir entices me for the striking visuals and convoluted plots, and though Backfire is hardly the most innovative example of the genre, it is a solid example of it. The plot is dense, requiring attention, but isn't so far gone as to be incomprehensible, and the unreliable nature of the narrations the main character gets from others' flashbacks keep up the sense of suspense. Like most noirs of the time, it also makes interesting commentary on the disillusionment many vets felt on returning to civilan life. If you are lucky enough to see this film- don't worry watching Backfire will not "backfire" on you! I've never seen this one surprisingly. I'll have to add it to my must sees - but save it for a night when I am not tired :-) I'm with you - film noir always seems to drag me in and get me hooked. i love film noir as well! Thank you for the great recommendation! If you get the chance to see it, I would love to know what you of it! © Never Fully Dressed. Design by FCD.